Rino Russo did the Hindu wedding artwork and Stefano Monda created the Christian wedding artwork. Bollywood actor Priyanka Chopra and American singer Nick Jonas’s wedding was the talk of town. The wedding got attention from across the world and it seems that the fever for celebration and pictures is still not over. 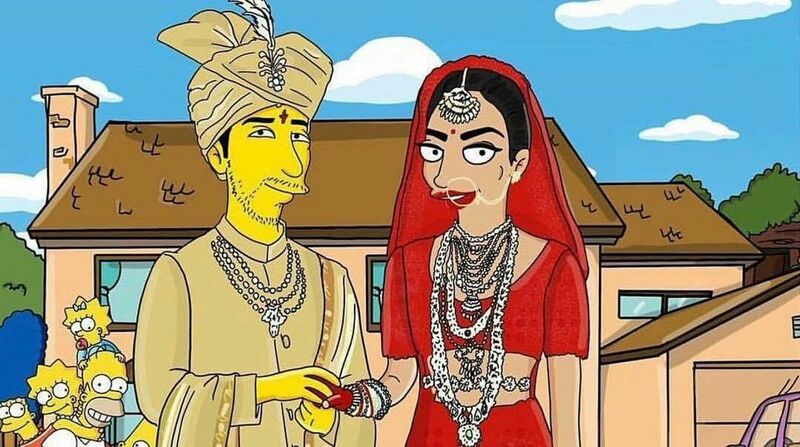 And now, the couple are receiving attention for two cute artworks based on The Simpsons characters. The two have been given a perfect look with upper protruding lips. Priyanka Chopra took to her Instagram account and shared the cute artworks. One picture shows the married couple in the traditional Hindu wedding dress and of course you can’t miss the Simpson family looking on. In the second picture, the couple are dressed for a Christian wedding ceremony with Homer Simpson officiating. Meanwhile, the couple is celebrating Christmas in London with family. Priyanka took to her Instagram handle and shared pictures. Not just that, the couple was seen shopping hand-in-hand on the streets of London. The couple got hitched on December 1 and 2 in Christian and Hindu ceremony at the Umaid Bhawan Palace in Jodhpur.